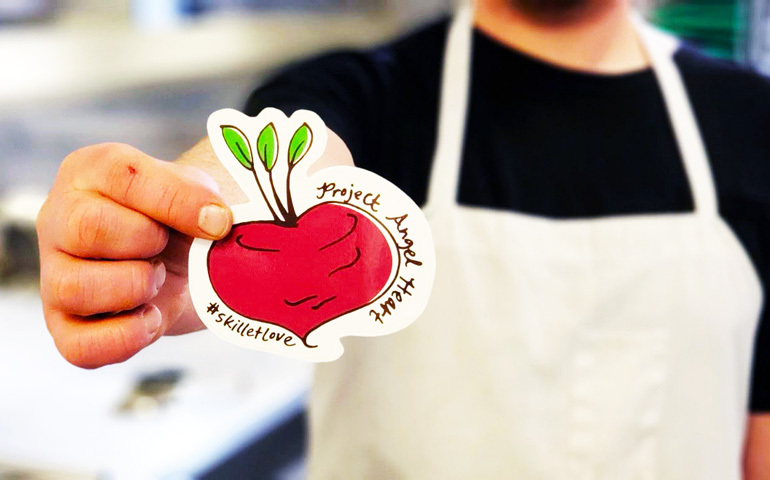 Project Angel Heart has almost funded their new tilt skillet, so it's time for a new one of their #SkilletLove stickers! Everyone that contributes to their fundraiser gets one of these awesome custom shaped stickers. Donate at their Skillet Love Funraiser page to help them fully fund their project, which means they will make 20 percent more healing meals. The $22,426 goal includes the cost of the skillet, plus installation and the extension of their fire suppression system. Any additional dollars raised will help with maintenance and operating costs. So donate and then check your mailbox for some of this skillet love in a sticker format. Project Angel Heart was founded in 1991 to address a major challenge for Coloradans who are ill or infirm, and that's getting the nutrition they need to get stronger, heal, and remain at home. They met their first goal, and now they are now trying to also fund the first batch of meals they'll cook in the new skillet. 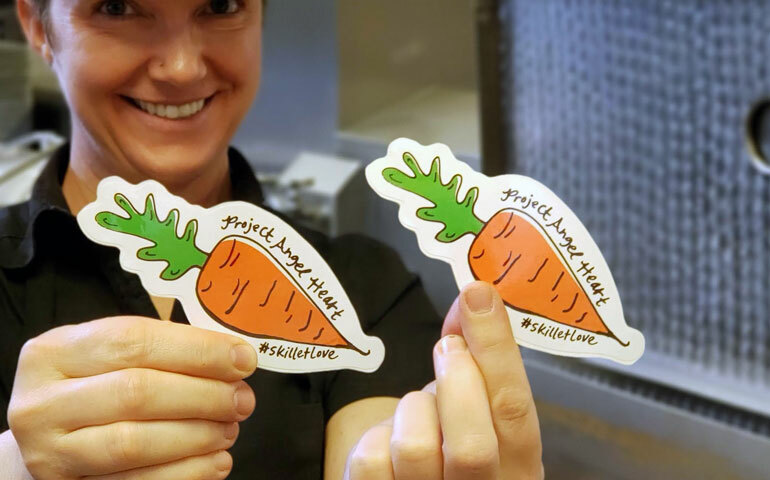 These die cut stickers are an awesome way to reward their donors, and we love that they are focusing on beautiful vegetables like the beet above and the carrots below. Many of the Project Angel Heart recipients are too sick to get to the grocery store or unable to cook for themselves. Others find they have to choose whether to buy food or medication to make ends meet, and that's where Project Angel Heart comes in with medically tailored meals. Each week, their professional chefs and registered dietitian prepare thousands of delicious meals, from scratch, and tailor them to meet the medical and dietary needs of those who are ill. Loving volunteers package and deliver each meal, free of charge, to neighbors living with cancer, HIV/AIDS, kidney/heart/lung disease, and other illnesses. In 2019, Project Angel Heart plans to prepare and deliver nearly 500,000 nutritious meals to 3,000 critically ill neighbors in Denver and Colorado Springs. This is such a huge help to their population, and we are proud they chose StickerGiant to help promote this campaign. And the results? Improved health and well-being for those in need. Project Angel Heart’s meal recipients report better health, less stress, and more energy. They’re better able to afford their health care and adhere to their prescribed health care regimen. It’s also easier for them to live independently in their homes. Research also shows that many Project Angel Heart meal recipients have lower health care costs and hospital readmission rates, and it all starts with a meal prepared with love and delivered with care.